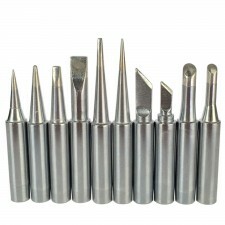 Home » Products » Tools » TECKE 10X 900M Soldering iron tips For HAKKO 936,937,907 soldering station . TECKE 10X 900M Soldering iron tips For HAKKO 936,937,907 soldering station . High-quality，Each one is electroplated for 72 hours，Advanced production process.not easily oxidized. Replaceable soldering iron tips 900M-T series for soldering station. 10 diffrent sizes and shapes,900M-T-I,B,2.4D,S3,1.2LD,LB,K,SK,C3,C4.